One of our favorite pulling exercises is the 3-Way Row. 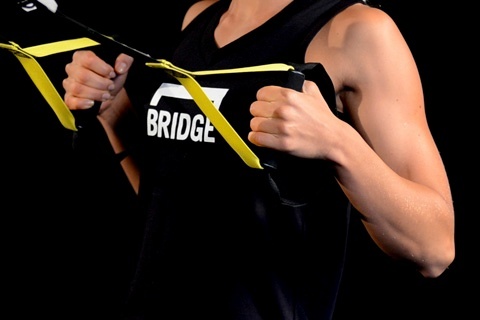 This can be used with resistance bands or suspension bands. Stand fancing the bands, holding a handle in each hand at chest height, palms facing up, arms extended. The first rowing motion is to pull your body toward the band with your palms facing up, keeping your elbows close to your rib cage as you pull through. Pause, then return to the start position. Repeat all reps as prescribed for this row before moving on to the 2nd movement. For the second row movement, perform the same rowing movement, but with your thumbs facing up and palms facing each other. And for the third rowing movement in this sequence, perform the row with your knuckles facing up, but bringing your elbows back at shoulder height. To recap - the fist two rowing movements, all that changes is the position of your hands. Keep your elbows close to your body as you pull through. For the third row, the position of the hands changes, but movement of the arms in the row changes to shoulder height, elbows with of your body. Move slowly for each rowing sequence and avoid thrusting your body up and using momentum to help with the pull. As you improve, lengthen the band and lean back further to increase the difficulty of the pull.